Life With 4 Boys: 5 Hot Summer Nail Tutorials for Short Nails! 5 Hot Summer Nail Tutorials for Short Nails! Photo from Abbie's Purple Room. She has beautiful designs! The other day I got sick and tired of looking at my plain old boring nails. This is summer dang it, we are supposed to be embracing the bright colors and pretty designs. So, I went on a search for summer nail tutorials. Unfortunately, while a lot of them are gorgeous, they are also super hard to do and are for people with really long nails. How many moms do you know with long nails? I did find a few great summer nail tutorials for short nails though that were simple and pretty, so I wanted to share them with all of my other mom friends too. This one is simple, but really pretty and bright. I love that is can work with any length nails and that you could basically use any color combination that you wanted to change it up. This one is really easy, it just requires a bunch of colors, but it is a great option for those who don't want to do fine details and it can work for long or short nails. This design is a little harder since it does involve details, but with a toothpick it really isn't that hard to do at all. Word of advice though, let the bottom coat fully dry before using the toothpick to make the designs or it is going to mess up the bottom coat. The woman in the tutorial has long nails, but with water marble nail art, it doesn't really matter if you have long or short nails. If you have never seen water marble art before, it is awesome and pretty simple to follow, but can be messy. Definitely tape your fingers first! This is a simple two tone tutorial for summer and then you just make dots in coordinating colors. Definitely good for short nails and you could use any color you like. I love the first one! I'm going to have to try it. I have done water marbling before and it can be frustrating. 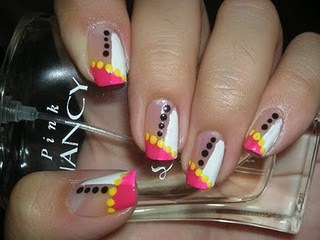 I found it hard to get your nail in just the right spot in the water to get a really cool design. It is really neat looking though if you can master it. I know I had a cup of water sitting on my kitchen counter for about a week from trying this. I really should paint my toes Renee. I practically am living in sandals or no shows at all this summer lol. Zebra sounds cool! It does take a while to do the water marbling. Did you try using a q tip or stick to get all the excess polish out of the water before taking your nail out? That can mess it up too. I always have my toenails polished, but rarely polish my fingernails. But, I think I'll try the first one... looks fun. Then again, I may be a bit too old for that look. I don't think so Donna. You are never too old for beautiful nails. You could always just use a straight line and dots and leave out the loops for something a little more grown up. Neat designs. I get a manicure but do my own toes. It would be fun adding some designs on them. Wow, I hadn't ever seen water marble nail art before. That's really amazing. I didn't know you could do that!